This would kinda be nice to have at home - make "deli" lunch meat alot more affordable! 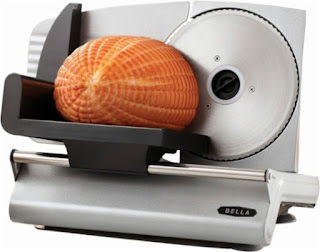 This Bella - Electric Food Slicer $29.99 (Retail $59.99). Valid 4/30. Slice meats, cheeses and other foods to your liking with this deli-style slicer, which features precision thickness control. The nonslip feet and blade guard provide safety while the slicer is in operation.